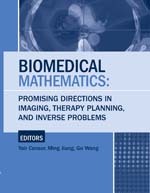 Biomedical Mathematics: Promising Directions in Imaging, Therapy Planning, and Inverse Problems Price Reduced! This book brings together 27 state-of-the-art research and review papers by leading experts and practitioners in mathematical methods in biomedical imaging, in intensity-modulated radiation therapy (IMRT) and in optimization and inverse problems. These papers were presented at the Huangguoshu International Interdisciplinary Conference on Biomedical Mathematics—Promising Directions in Imaging, Therapy Planning, and Inverse Problems November 3–9, 2008 in China. The emphasis is on trying to discover relations and connections between these fields that will enhance progress in each of them. As this volume shows, applicable mathematical work in these fields goes hand-in-hand with real-world applications and the mutual "technology transfers" between them leads to further progress. The topics covered here include mathematical aspects and practical problems in current major and emerging technologies in diagnostic and therapeutic medicine and biology research. The contributed work signifies the interdisciplinary cooperation between mathematicians and scientists from medical physics, engineering, clinical medicine, and biology that leads to mathematically based better solutions of practical problems in biomedical imaging and IMRT.